File this prosaically-titled How Do You Like This Piano Playing? under the "music discovered in a backyard shed" category. Pianist/composer/arranger/conductor Hal Schaefer's musical journey began with stints in big bands led by Benny Carter, Harry James, and Jimmy and Tommy Dorsey, but his most notable gigsfrom a fame-gaining perspectivehave been as a vocal coach to the stars: Susan Heyward, Mitzi Gaynor, Robert Wagner, andthe jewel in that particular crownleading Jane Russell and Marilyn Monroe toward their singing contributions in the movie Gentlemen Prefer Blondes (1953), including Monroe's classic turn on "Diamonds Are a Girl's Best Friend." On this solo piano outing from 1960taken from a tucked-away and long-forgotten tape discovered after a gardener warned Schaefer of an insect infestation in the artist's Florida backyard shedSchaefer immerses himself in seven American Songbook classics like a man delving heart and soul into sacred tomes, in a reverent and deeply personal exploration of the permutations of familiar melodies. The set opens with the potentially bombastic Irving Berlin song, "There's No Business Like Show Business." Schaefer turns the tune into a solemn prayer, tweaking sections of the melody until they open up to reveal their inner truths, then bumping some honky-tonk rollick into the mix, all the while maintaining the integrity of the piece. Schaefer digs beneath the surface of "Dancing in the Dark," pulling up subterranean notes from beneath the dance floor and adding a bluesy bar room tone to the proceedings, twisting and stretching time while keeping the song recognizable. And he does this time and again, on Rodgers and Hart's "My Romance," Cole Porter's "Love for Sale," and Kern and Hammerstein's "All the Things You Are." This is pared-down, no-nonsense playing, beautiful and exploratory expeditions that result in seven strikingly personal interpretations of the great songs laid down on tape all those years ago, without, it seems, any consideration given to commercial possibilities or pressing the work into (then) vinyl. Thanks be to the sharp-eyed gardener. This CD is a gem. The bugs can't have it. 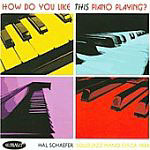 Hal Schaefer CD/LP/Track Review Dan McClenaghan Summit Records United States Benny Carter Harry James Tommy Dorsey How Do You Like This Piano Playing?